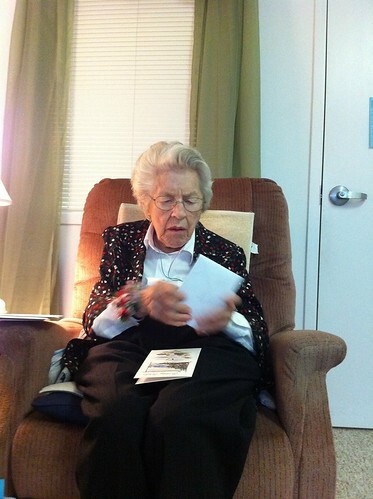 On June 9, we celebrated my grandma’s 91st birthday! As is our tradition, we she takes us out for lunch. This year we went to a nice restaurant instead of the typical tea room. It’s usually a women’s trip, but babies of all genders are always welcome! Maximus prepared for the birthday by taking a two-hour morning nap. That was exactly what I needed so I could get myself ready and also take advantage of the vacation day by cleaning the house. Had I planned for that, we all know he wouldn’t have napped. Well done, baby dude, well done. I was a little anxious about the 45 minute car ride since he usually sleeps on long trips. Considering I woke him up moments before my mom arrived, we were playing with fire. He fed himself a bottle and then played with a toy for at least 30 minutes! One single toy! Amazing, I tell you. Again, I couldn’t have planned or hoped for better. We arrived at the restaurant and were happy to be in a new environment. Thankfully he sat in the high chair for an hour before he was ready to get out. He ate Cheerios (spilled a lot of them too), refused chicken dinner baby food, and happily ate whatever anyone wanted to share. He had some carrots, green beans, pineapple, egg, and potatoes. While we ate dessert, I showed that my baby could devour baby food if he wanted. Mixed berries are one of the few foods that he acts like a baby bird for. As fast as he can swallow, that little mouth is open and waiting for more! As is the case with babies, a performance is a must when around people. Maximus did a good job of showing off. He had a busy afternoon of clapping, giving high fives, saying “dadda,” laughing, crawling, and pulling himself up. He does know a few strangers, but is perfectly content sucking his thumb and shyly looking at them from the comfort of his mama’s arms. While we had a great afternoon, we did skip the afternoon nap. A car nap of 45 minutes doesn’t constitute a successful rest at 5 in the afternoon. When we got home I had a very crabby baby who couldn’t get happy doing anything. I sent him off to bed an hour early and enjoyed an evening of “me” time. 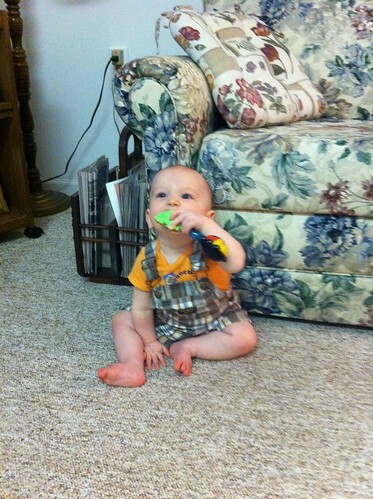 This entry was posted in Baby, Life, Maximus, Milestones by Kyley Leger. Bookmark the permalink.